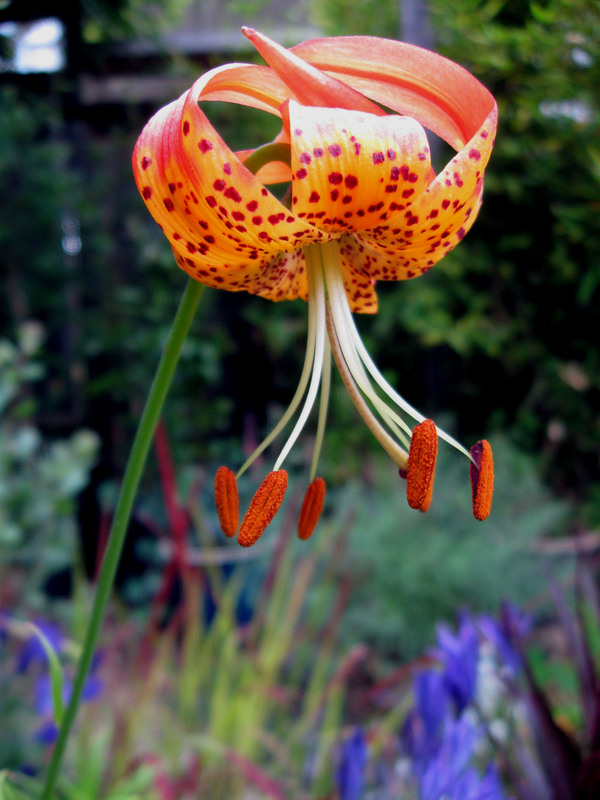 Our Leopard Lily Lilium pardalinum ssp. pardalinum (also listed as Panther Lily and sometimes Tiger Lily, why not Ocelot Lily or Jaguar Lily?) popped yesterday, just in time for Garden Bloggers Bloom Day (click thru for links to tons of gardenblogs showing what they have blooming). This is its second year for us, and it multiplied in the pot, but it’s looking like it might only do this one flower so we need to cherish it. It might be the coolest flower we grow. We’re still learning about the native lilies. They seem relatively easy, but the hardest part is getting them. They’re only available from the commercial growers for a couple of weeks each year while they are in bloom. The Leopard lily showed up on the availability lists this year for about a week, but it sold out before we were ready to do an order, to be replaced by the “Corralitos Hybrids,” which will also sell out almost immediately. I have about two dozen lilies that I’m growing myself, but they are sloooow, two years to make a plantable 4″. I didn’t know the Corralitos Hybrids but they are a cross between Lilium pitkinense and Lilium kelloggii, both of which are native to Northern California. (Pitkinense is sometimes listed as a subspecies of pardalinum. Pacific Bulb Society has photos of all of these lilies.) We snagged a half dozen, but they’re getting installed tomorrow and only spent four days in our yard. 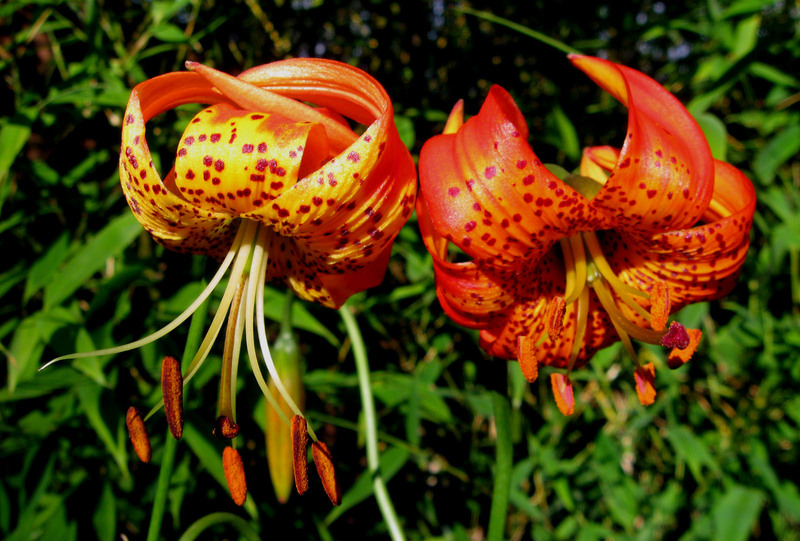 I took a photo of the two lilies side by side, the leopard lily is on the left, the Corralitos Hybrid on the right. We normally prefer to install plants when they aren’t blooming, but it’ll be pretty nice to show up at the job site with some of these. In retrospect, we should have ordered more and kept a few for ourselves. Ah, well. 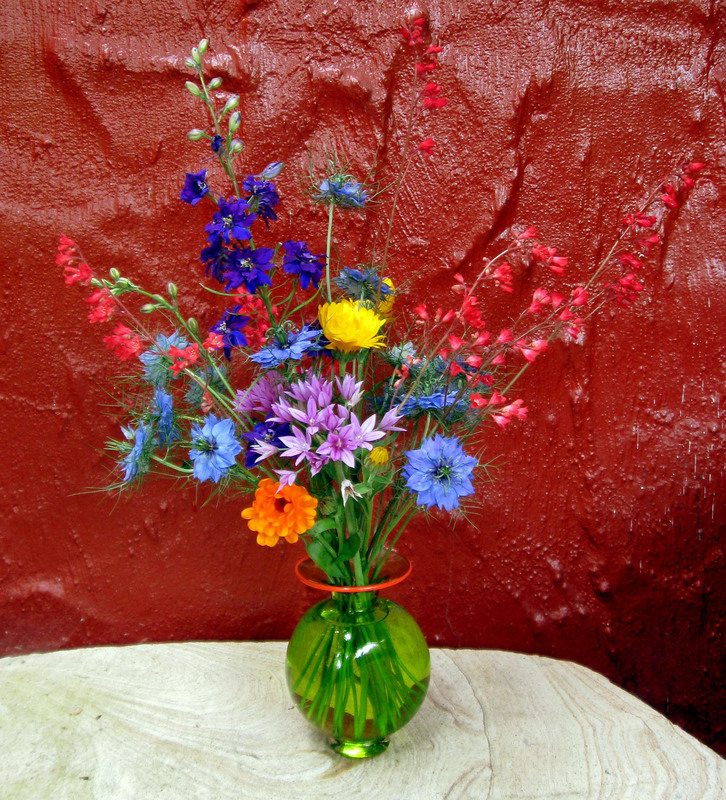 A floral arrangement from last weekend shows several of the other plants blooming in our yard right now: Love in a mist (Nigella), Calendula, Heuchera “Torch, Larkspur, and the last of our Allium unifolium for the year. Check at May Dreams Gardens for lots of other plants in bloom and thank you Carol for hosting. This entry was posted on Sunday, June 14th, 2009 at 11:18 pm and is filed under bulbs, california natives, garden bloom day, plants. You can follow any responses to this entry through the RSS 2.0 feed. You can leave a response, or trackback from your own site. The leopard lily is amazing. I think I’d heard it called tiger lily. Though leopard makes more sense with the spots. Ocelot lily would be a nice name. Maybe if they breed a miniature one. The Leopard Lily is fantastic! What a beauty, thanks for sharing. Like your comment on the lily. A spotted tiger? Probably a plant named by a botanist and not a zoologist… I remember my first face to face encounter in the wilds with one of these large lilies (I don’t remember the species now). The plants were taller than I was, and surrounded by mountain azaleas. Totally jaw-dropping–nothing subtle about that experience. Nice bouquet! The Lilium pardalinum is relatively easy to grow from seed if you have the time and space to get it going. I grew a bunch a few years ago and gave most of them all away. It’s never bloomed in my garden, including the bulbs I bought on the market. Sigh. My grandmother always used to have a patch of tiger lilies in her garden; they were orange and spotted, but that’s where the resemblance to yours ends-they were definitely a different flower! Whatever they are called I loved hers, and yours are amazing too! Your floral arrangement is lovely. I’ve planted lilies on my allotment to use as cut flowers for the house. I also grow lilies in containers in the garden, but I can’t bear to cut flowers for the house from the garden. I’m wondering how I can propogate it further, just plant the seeds? or does it follow the lilly/iris pattern of cloning itself? Nice work. Pretty cool to just find one in your yard. I’ve grown them from seeds. The seeds take three or four months to germinate, but you don’t really have to water them diligently while you wait, and then the plants are slow but not fussy. I think they also make little plantlets up in the joints of the branches, though I don’t remember for sure that they’re one of the ones that does that and mine haven’t done it yet. I haven’t ever divided mature ones; the bulbs seem delicate so it probably needs to be done carefully if at all. Anyways, that’s my experience, good luck.